The Abrams Dinner Party isn't really a party ... it's a group of bloggers who are receiving free cookbooks from Abrams for the next couple months. Since I'm a cookbook fiend, I'm giddy happy about participating in this. 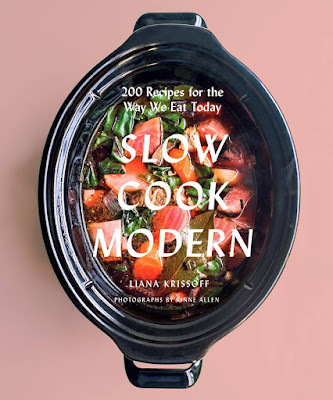 I just got Slow Cook Modern by Liana Krissof, and dived right in. The hook with this book is that it tells you want to toss into the cooker in the morning before work and then there's usually another step after work, usually adding ingredients that cook quickly or need to be warmed. I've made one recipe so far. It was called chicken with red rice. The rice was red from tomatoes, not the naturally red rice. It wasn't a particularly pretty dish, but it was comfort food for sure. I mean, chicken, rice, tomatoes and spices ... yeah, that's good. There was a cilantro-lime topping that was included as a garnish, but I didn't make that. My cilantro plants were ... very dead ... so that wasn't going to happen. That was probably the most simple recipe in the book, but I had leftover rice and I had chicken thighs, so it was a perfect fit. Basically, it was skinless chicken thighs, cumin, oregano, paprika, crushed tomatoes and salt going into the slow cooker for the first part of the process. When the chicken was done, it was tasted to adjust seasoning, and the the rice was added so it could warm up for serving. It wasn't the prettiest dish on the block. That green garnish would have made a huge difference in the presentation. Or even some slices or chunks of avocado. But it was dinner time, I was hungry, and I wasn't about to run to the store for cilantro. I devoured it. YUM! This was a keeper. But my presentation was ... ugly. Also, the lighting wasn't great. But ... yeah ... not pretty. See! Even food bloggers eat ugly food sometimes. Gah. That's really ugly. However, I got smarter with the leftovers. I still didn't have fresh cilantro, but I pulled out a bottle of cilantro-jalapeno-lime sauce that I happen to love. I artfully garnished ... uh ... not-so-artfully poured some sauce on top of my reheated leftovers, and it looked a lot prettier. You want this. You really really want this. The flavors also enhanced the chicken and rice, so I completely endorse the original garnish. A couple of sprigs of fresh cilantro would have made this photo even better ... but remember that dead cilantro? Yeah, still dead. And I haven't been to the grocery store today. So, now that I'm not hungry any more, let's talk about the book a bit, mkay? The recipes in the book don't shy away from using ingredients you'll probably have to shop for. Most of the vegetables are fresh, so you'll be shopping for those, right? At that point, you can pick up the fresh herbs or other things you don't have. However, most of the ingredients are common enough that a well-stocked grocery store should have most of them - no need for scouring obscure websites for odd things that you've never heard of. So ... it's not pantry cooking, but it's also not project cooking where you have to plan weeks in advance. It's good for weeknight dinners. There's also not a lot of processed food in this book, except for the occasional frozen vegetable or canned tomato products, like the crushed tomatoes in the recipe I made. The chicken stock (or other stock) occasionally called for in recipes could be your own homemade stock, or you could buy it, whichever is better for you. But otherwise you can assume you'll be shopping for individual. mostly-fresh ingredients rather than canned soups or packaged mixes. While slow-cooked food tends to be sort of monochrome as everything cooks together, this book pays attention to eye-appeal, suggesting side dishes or garnishes that will add some color and punch to the plate. Some of those side dishes aren't cooked in a slow cooker - like cornbread or pesto or quick pickles - but it gives you a good idea what sides or garnishes to use with the dishes. I mean, if you happen to pick up some corn muffins at the store or you open a jar of mixed pickles instead of making every bit from scratch, that's fine, too. The recipes in this book aren't your basic soups and stews. Sure, there's chili and chicken soup. But there's also Herb Butter Braised Turkey Breast, Jungle Curry Stew, Lamb Harira, and home made Quark. Lots of recipes that are pretty darned creative. Tarragon and Creme Fraiche Chicken might be next on my list. Or maybe the Caldo de Pollo, because sometimes chicken soup isn't just chicken soup.